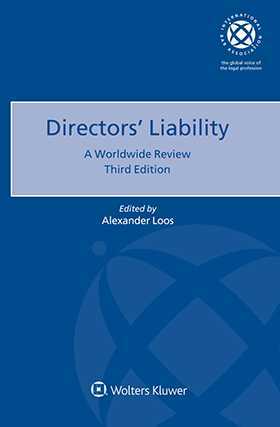 Directors’ Liability is an acclaimed reference book for international business lawyers with its first edition in 2006, and second in 2010. Now in its third edition, and once again published in conjunction with the International Bar Association, this comparative study of a crucial issue in corporate law gives practitioners a powerful and decisive tool for ascertaining and comparing the law affecting directors’ liability in today’s globalizing economies. Covering nearly fifty jurisdictions worldwide (including eight not previously covered), the third edition affords senior lawyers in major firms the opportunity to provide concise, detailed, and easy-to-understand summaries on his or her home law on directors’ liability. Authors whose research appeared in earlier editions have updated their chapters, and the case law summarized and analysed now reflects published cases through the end of March 2016. The contributions describe the relevant law in force in each particular jurisdiction, along with an insightful discussion of trends and future prospects. This reference book not only provides access to reviewing the respective laws and court rulings from different legal backgrounds but also enables to compare their laws and rules as well. Where applicable, coverage also includes the legal implications of jurisdictional variations in such matters as judicial review, lawyer directorship, directors’ reliance on outside professionals, and the effect of the European Action Plan. References have been thoroughly updated throughout and include many new online sources. This book comprises expert reviews addressing their specific home jurisdictions, each following a uniformly applied template of issues to be dealt with and is up to date on insightful discussions about the most recent trends and foreseeable developments in D&O liability, thereby serving as a ‘ready to use’ material for the readers. This publication will be of enormous value to legal practitioners, whether in private practice or in the legal department of a globally active company, as a comprehensive and easy means of access to the law of foreign jurisdictions on directors’ liability. Bolivia Ignacio M. Aguirre U.